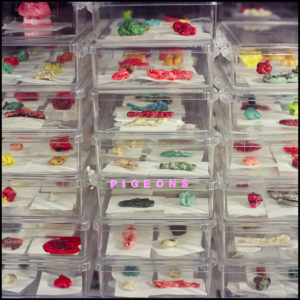 Pigeons is Wednesday Knudsen and Clark Griffin, from Bronx, NY. After flirting with lo-fi psychedelic-leaning Francophile pop on their two previous full-lengths, Liasons and Si Faustine (both from 2010), the pair have shifted into more dense, heady modes for their new record, They Sweetheartstammers. Heavy doses of melody & dissonance carry free-form songs like “Lauren” and “Behind the Reeds” into Broadcast and Meddle-era Floyd territory. The more-straightforward “Red Friend” and “Tournoi” offer differing ends of the pop spectrum, with (unconscious) nods to Opal’s Happy Nightmare Baby, Galaxie 500 and Brigitte Fontaine. The sole constant throughout the twists & turns of They Sweetheartstammers is Wednesday Knudsen’s stunning guitar work and distant, plaintive voice. With the new record comes a new line-up: Pigeons have expanded to a four-piece for performances, anchored by Jason Meagher on bass and Nathan Bowles on drums. You’ll know Meagher as the bass player with No Neck Blues Band and owner of Black Dirt Studios (where Knudsen and Clark have recorded much of their material), and Bowles as part of the Black Twig Pickers and latterday Pelt. They Sweetheartstammers features artwork from filmmaker / archivist Yuji Agematsu and lettering by Keith Connolly.